Established in 1980, Institute of Management Technology (IMT), Ghaziabad has been consistently ranked as one of the best management institutes in the country. This year, the institute has received accreditation from the Association of Advanced Collegiate Schools of Business (AACSB), US, a prominent business school quality certification body. This makes it a part of a group of 755 business schools in 51 countries to receive this internationally recognised accreditation. Recently the institute went through an overhaul of the curriculum that was led by professor Srikant Datar of Harvard Business School and the author of ‘Rethinking The MBA’. This is aimed at achieving the alignment of the curriculum with the institute’s vision of innovation, execution and social responsibility. IMT Ghaziabad offers two-year PGDM full time programmes in Marketing, Finance and Dual Country Programme. With the revamping of the curriculum, ‘Design Thinking and Innovation’ and ‘Critical Thinking’ have been made mandatory in the first year of the programme. A three-credit course on ‘Sustainability and Social Responsibility (SSR)’, which requires working with the community has also been included. The institute is supported by the local district administration, the police administration and the development agencies in ding so. In another change, IMT Ghaziabad has launched a full-fledged specialisation in Entrepreneurship. 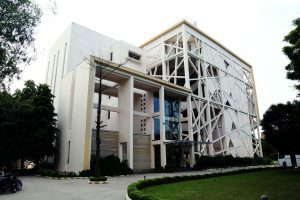 According to the institute, it is probably the only B-school that will have a required entrepreneurial immersion with start-ups spanning across six weeks for each student in the second year of the programme. Also, IMT Ghaziabad will offer domain specialisations within the major specialisations. For instance, one can specialise in Finance and can take up a minor in Banking, Equity Research, and Development Bank Management etc. IMT Ghaziabad’s permanent faculty are all respected professionals who have been globally rewarded for their achievements in their respective fields. Many of them are internationally acclaimed scholars who lead executive programmes at IMT and are strongly focused on synthesising partnerships with global institutes. The faculty acts more as mentors than teachers. The institute is working on a model where students undertake projects and then based on their experiences, there is a discussion in the classroom, which is from ‘Doing’ to ‘Knowing’. Spread across an area of 14 acres, IMT Ghaziabad’s fully residential campus has emerged as one of its kind in India. The newly constructed blocks have centralised air-conditioned classrooms. The infrastructure also includes a state-of-the- art auditorium, student hostels, mess, canteen, guest house etc. The two-floor library with its extensive collection of books has the most recent publications of magazines and journals. The entire campus is Wi-Fi enabled to ensure connectivity. “Two years of IMT helped me learn a bit of everything — from strategy to operations from the best of the marketing gurus — interact with a wide range of students from various industries and best of all, live in an amazing campus that never sleeps,” says Geoff Mathew, 25, batch of 2013. In this placement season, IMT received 357 offers from 105 companies, with a 20 per cent increase in the average package. Top recruiters included Microsoft, Google, L’Oreal, Accenture, SAP, Goldman Sachs, Deloitte, Britannia and PWC, among others. The offers received from e-commerce companies at IMT Ghaziabad have increased by 13 per cent this year.